Sometimes, you can combine several different recipes to make an entirely new one….. For example, last night I combined my Amazing Vegan Cheese Sauce with my New Mexico Red Chile Sauce to make these Stacked Red Chile Enchiladas, and let me tell you…..they were AWESOME. 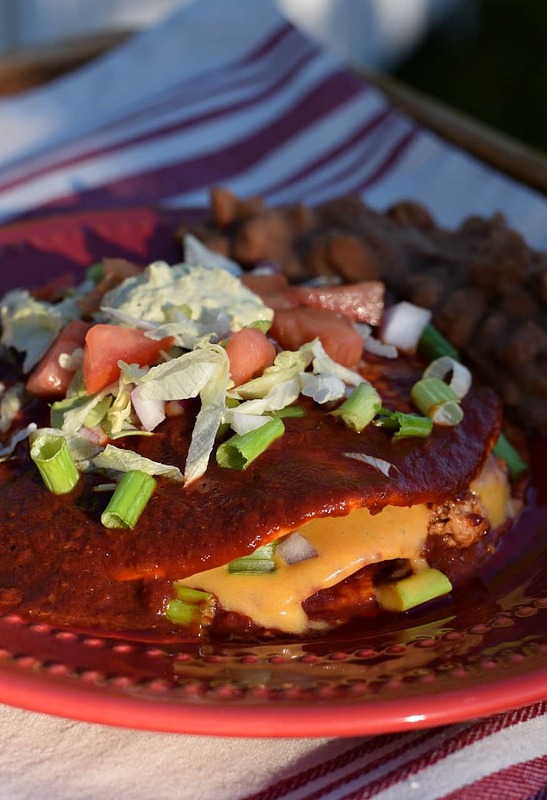 Picture a stack of oil-free Corn Tortillas – all sandwiched with tangy Red Chile Sauce, thick, gooey, melted Cheese, and a spoonful of chopped onions in between. And of course, smothered in even more Red Chile Sauce and all your usual Mexican Food garnishes, shredded lettuce, fresh tomatoes, black olives, cilantro, etc. Oh my heck ……they were SOOO good! Once you get a taste of REAL New Mexican food, you’ll never look at those cheap Tex Mex Restaurants the same. And what’s even MORE amazing, there is NOTHING bad in this type of meal! Red Chile is full of Vitamin C.
Don’t forget the Corn Tortilla – full of magnesium and fiber, and did I mention it’s all OIL FREE? Could you believe Mexican Food could actually be HEALTHY? Now I’m not saying that Bean Burrito off the Taco Truck is healthy – heck no! Most Tex-Mex Restaurants or Fast Foods are full of grease and oil, not to mention loaded with full-fat Dairy Cheese, and Meat…of course. 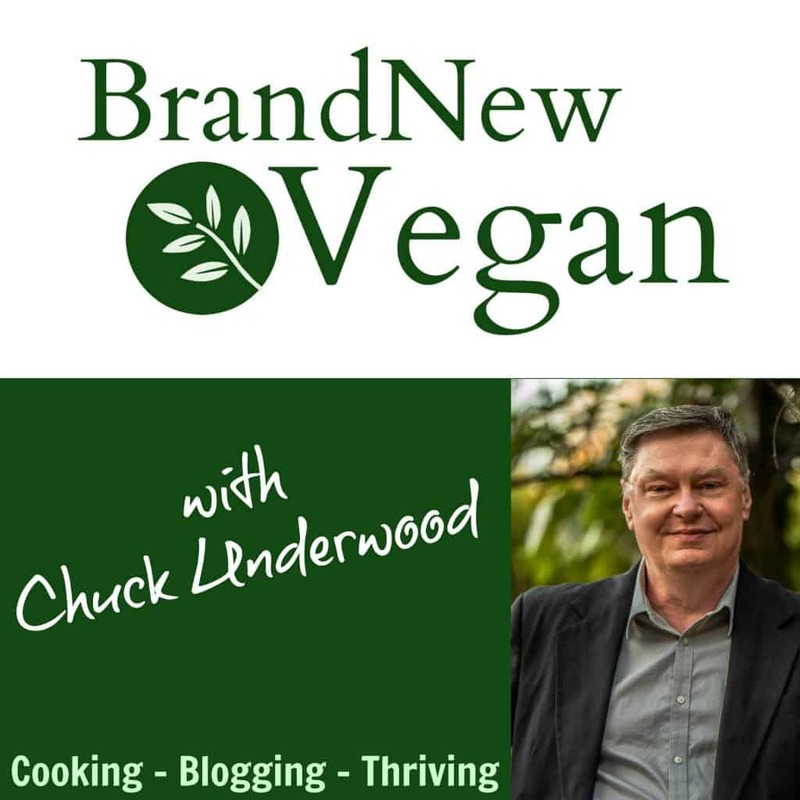 No – I’m saying when you cook Mexican Food AT HOME – it can be VERY healthy, filling, and down-right delicious WITHOUT all the fat, oil, cholesterol, dairy, and even the meat. Don’t believe me? I’ll bet the Carnivores in your family will love these as much as you do. The Cheese Sauce and Red Chile Sauce DO take a bit of work – so definitely plan ahead. But you can take steps to make it easier. For example I roasted my Chiles while my Potatoes were boiling. Then it was just a matter of rinsing out the blender in between uses. 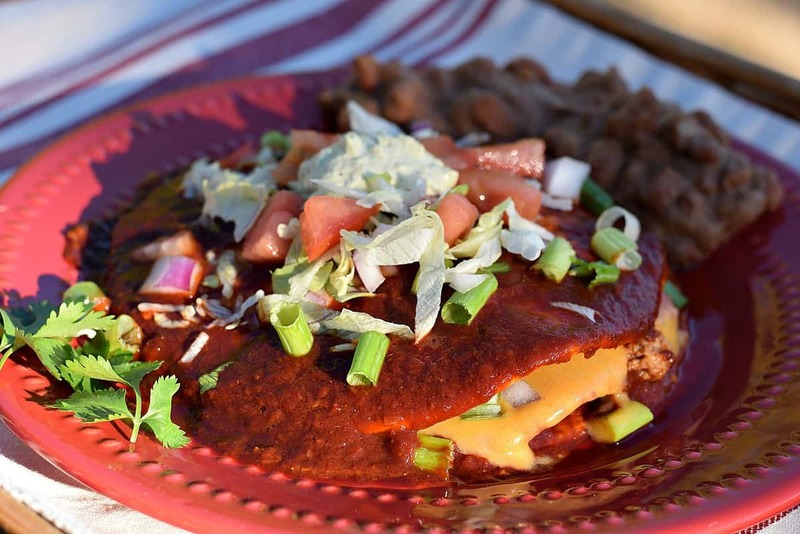 To assemble your Enchiladas – spoon a few tablespoons of Red Chili onto a large dinner plate and cover with a Corn Tortilla. Then spoon on some more Red Chile, a spoonful of onions, and then cover that with cheese sauce. Add another tortilla and repeat. More red chile, more onions, more cheese, and another tortilla. I made a stack of 3 Tortillas and covered the last one with just Red Chile. Microwave the entire plate for several minutes until the cheese melts and the tortillas are cooked through. Be sure to use a microwave-safe plate! And even then – BE CAREFUL! it may be HOT! The Red Chile Sauce recipe made just enough for 4 plates of Enchiladas (which my wife and daughter attacked VERY aggressively I might add). And if you made the Cheese Sauce fresh for this meal, you’ll have leftovers for another dinner. Simple Recipe – just using recipes you’ve probably already made – and combined to make something completely different. Got another example of combining recipes? I’d love to hear it. 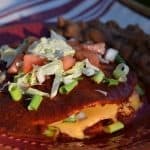 Stacked Red Chile Enchiladas - with fresh New Mexican Red Chile and a Vegan Cheese Sauce that will have even the die-hard carnivores begging for more! Hey Chuck. Thanks again. I’ve been wanting to make enchiladas and tortillas for dinner. Looks like a good time to get to cooking up some Tex-Mex. Hi Chuck, I finally made your New Mexico Red Chili Sauce and was going to make your enchiladas. After reading the directions I realize that you microwave them. For years I made enchiladas in the oven. Can I still do that with this recipe, or will it not work with the cheese sauce?